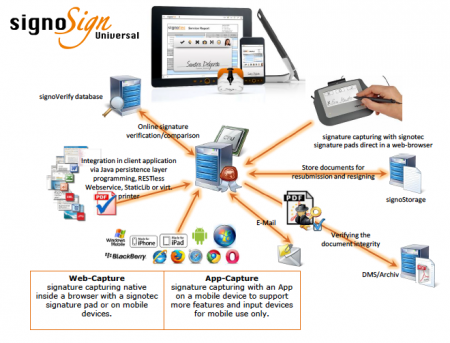 signoSign/Universal is a product to realize the server based integration of a workflow without media discontinuity. A special feature of signoSign/Universal is the support of mobile devices and the possibility of using stationary signature pads. It is possible to work mobile, stationary or to use both technologies. The application is working on the client site without additional software, with all established browsers like the Internet Explorer, Firefox, Safari or Chrome. Additionally the popular signature apps are available for iPad or Android users, which can be used but don’t have to. Supported input devices are the signotec signature pads, iPhone, iPad, and Android or Windows Tablets. A browser like Safari, Firefox, Chrome or IE is required. Depending on the chosen technology, just a minimal or even no software installations are required on the client side. Starting the customer web application within which a link refers to a PDF/SGN document. Touch/click one of these hyperlinks. Via the gateway the chosen document is going to be temporally loaded in the signoSign/Universal Viewer web application. Where the document data, which is needed to display the document, is going to be extracted. These document data (not the document itself) are going to be transferred to the signoSign/Universal Viewer for displaying and processing/signing. After processing or rather signing, the document data are going to be sent back to the signoSign/Universal Viewer web application by using the save-button. There they will again be implemented in the customers document, which is (via the gateway implemented by the customer) going to be exported to the customers web application and saved there. Documents signed with signoSign/Universal can therefore be checked at anytime, by anyone, without technical effort. The biometric data can be processed according to ISO/IEC 19794-7: Biometric data interchange formats – Part 7: Signature/Sign Time Series Data. Advanced electronic signature according to DIRECTIVE 1999/93/EC OF EUROPEAN PARLIAMENT AND OF COUNCIL of 13th December 1999 on a Community framework for electronic signatures. BiPRO Norm 262: The norm is defining the procedure of signing in business processes in the insurance industry, in which documents are used that require a declaration of intend.